It is also called super-realism, and in painting is synonymous with photorealism. 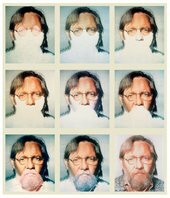 Leading painters were Chuck Close, Robert Bechtle, Richard Estes, Audrey Flack, Ralph Goings. In sculpture the outstanding practitioner was Duane Hanson, together with John de Andrea. More recently the work of Ron Mueck and some of that of Robert Gober could be seen as hyper-realist.